I have sometimes seen comments to this blog that are disparaging towards the idea of stealth operation. I don't for a moment accept that stealth antennas are worse than the modest wire antennas many hams in the UK who don't have deep pockets, large gardens and amazingly tolerant neighbours use. RF doesn't care whether an antenna is visible or not, it's what you do to make the antenna invisible that might compromise performance and with the small gardens without trees that so many of us in the UK have, most of us have to live with compromise. But the real test of a ham radio station is whether it allows you to pursue enough activities to maintain interest in the hobby. And based on that criterion I think G4ILO does very well. One of the best additions to the shack was to make a dedicated work area for construction in a bureau unit whose door drops down to make a work surface and which can be closed when I have done enough without having to put everything away. I have a greater interest in building stuff now that I have somewhere to do it. In fact there are more things I would like to do, radio-wise, than I have time to do. Last weekend, for example, I would like to have tried making some contacts in the worldwide RTTY contest but of all the radio things I did that weekend, giving away some contest points was something I didn't get around to. Today I was trying to finish up my homebrew SignaLink USB clone, but I made the mistake of turning the K3 on and leaving JT65-HF running and I kept on being distracted by seeing CQ calls from DX stations. In between work on the interface I made contacts with YV6BFE, N8ABY, AA1CZ and KD0AGX plus a couple of Europeans, all using 25W to the attic dipole. My signals were spotted in Japan and far eastern Russia, though I didn't hear anyone that far east. DU1GM, whom I worked a few days ago, was calling for most of the afternoon with no takers. The SignaLink USB clone is just about finished and does work. After I made up an interface cable between it and the FT-817ND I made one solid PSK31 contact with F5TTI on 30m with it on the test bench. So now it just has to be put into its case and it will be completed. This morning a small package arrived from India. It is a FoxTrak-M APRS Tracker Module kit from Fox Delta. Fox Delta has an interesting range of kits for anyone interested in APRS, packet radio, digital modes or EchoLink. They are all extremely good value - the website suggests that they are sold on a non-profit basis. A couple of weeks ago I asked about one of these kits in a forum somewhere and an American ham complained that the parts were of poor quality, the instructions were poor and it took a long time to come from India. I think that is just the biased nonsense one sometimes hears from US hams about anything from India or China. The PCB is screen printed and looks fine, all the components are standard components and have been packed into individual small polythene bags for each value, and it took a week to arrive which is a lot faster than anything coming from the US via the postal service. 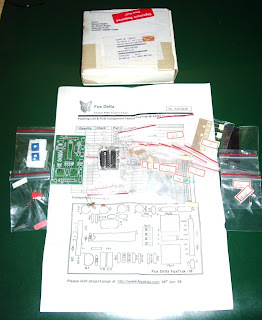 It's true you don't get Elecraft style step by step building instructions, but it really isn't rocket science to work out which part goes where on the circuit board. Hopefully this module will form a stand-alone GPS tracker that I can use with my other VHF radios. However, before I get started on it I have to finish my DIY SignaLink USB project. After installing the four port serial card in the shack PC which allowed me to have computer control of my Elecraft K2 I decided to borrow the USB sound card that was being used by my EchoLink hotspot and get my HF APRS gateway up and running again on transmit as well as receive. It is running very well and, although I suppose it may just be conditions, it seems to be receiving more stations than when I was using the K3. I am also surprised at how well my 10W output gets out. The experts are always saying how poor a mode FSK300 packet is, but I transmitted several test messages (into my stealth attic magnetic loop) and they were all received by other gateways. However, something went very wrong on Sunday. Replies to a couple of messages I sent kept being received over and over again. I also kept receiving the same messages over and over again from a couple of stations. It was like the film Groundhog Day, except it was more like Groundhog Five Minutes. And it was very annoying as these damn messages kept generating pop-up balloons from APRSISCE's new messaging system. Eventually I became convinced there must be a problem with APRSISCE and I sent a bunch of logs over to Lynn, KJ4ERJ, the program's developer. However I now think the problem is down to the configuration of some stations in Europe that are unnecessarily digipeating or gating traffic from the internet to RF and somehow managed to create an endless loop. Aprs.fi shows that some of the messages continued to circulate for more than 10 minutes after I had shut down all the computers and radios and gone downstairs in frustration. But even Lynn hasn't manage to figure out who the culprit was. The trouble with the APRS HF network in Europe is that there is no co-ordination at all. Anyone can connect some software or a TNC to a radio, configure it however they see fit (perhaps basing their settings on out-of-date books, obsolete web pages or nonsense thinking like "WIDE5-5 must be more than twice as good as than WIDE2-2") and start digipeating or gating traffic regardless of whether there is a need for it. There are stations in France who are gatewaying information from VHF to HF that serves no useful purpose there. What use is it to me in the north of England to know the meeting date of a club in the south of France or the details of a repeater in the Pyrenees? These days it is far too easy for people to get on the air without first having to properly understand what it is they are doing. And many hams seem to think it is their duty to radiate RF even if the most useful thing they could do in this particular case is simply to receive. You can't have a network without co-ordination of the stations that participate in it. But, no doubt in part because we all speak different languages, there is no online forum that everyone doing APRS on HF in Europe can join to discuss the issues and resolve the problems. Now that I have my K2 connected again for computer control I have found that a few things in KComm that worked with the K3 don't work with the K2 because the control commands, though they may look the same, don't all work the same way on both radios. So I spent yesterday evening fixing the problems. One of the things that didn't work was the auto-repeat option for CQ calling. I was testing it by sending a CQ on 30m with just 1W output into the magnetic loop in the attic. I didn't expect anyone to come back to me, and no-one did, but I was surprised that my signal was spotted in Northern Spain by EA1GFY. The effectiveness of that magnetic loop antenna never fails to amaze me. I don't think many people use as little as 1W on PSK31 but it would be interesting to see what you could work with such low power. It seems to me that 1000 miles per watt should be perfectly achievable. I've made a few contacts using the K2 and 4 or 5 watts over similar distances to what I'd expect using the K3 and 40 watts. I think conditions, more than power, determine how far you can work. More power just makes it easier. I installed a four port RS-232 serial card in my shack PC today. When I bought the computer earlier in the year I purchased and installed a two port serial card, thinking that would be enough. But it wasn't. You can never have enough serial ports if you want to interface with radios. With four, I can now have CAT control of both the K2 and the K3, the TNC connection to the Kenwood TM-D710 and one more which is currently controlling the PTT of the FT-817 for the EchoLink node but could be used for the control port of the Kenwood if I ever decided to use that for EchoLink. No more hassles with USB to serial adapters, and all my USB ports are free for things like sound cards. I don't know why people use laptops for shack computers, they provide far fewer options. Needless to say, things did not go as smoothly as they could have done. I thought I could have COM2 for the K2, COM3 for the K3 which would be easy to remember. But Windows gave the ports the designators COM3, 4, 10 and 11. There's an option to reassign the port numbers but Windows claimed that everything from COM2 to COM9 was in use. By what, was my unanswered question. In the end I decided to name the ports COM2 through COM5 as I wanted regardless of Windows' protestations. They did work, but finding out which port was which was a matter of attaching a radio to one socket, loading a program and trying all possible COM port numbers until it worked, as there was no logical correspondence between the numbering and the sockets on the back of the computer. Who said it was meant to be easy anyway? Despite all this I managed to make a few contacts using JT65A on 20m including DU1GM, N0OB and K1CF, using 25W to the dipole. Although I now have computer control of the K2 I don't have a sound card interface as I have cracked open the plastic case of the USB audio dongle and superglued the bottom half containing the PCB to the stripboard on which I will be building my homebrew SignaLink clone. Of course, now I have a serial cable connection between the computer and the K2 I don't need a VOX controlled interface, never mind an isolated one because the serial cable will bypass the isolation anyway! Anyone else seeing this diabolical interference on 20m? Several of my blogging compadres have written recently about using the JT65-HF software by W6CQZ so I thought I would give it another try to see if I could understand what all the fuss is about. This is not the first time I have tried the program. I tried it at the beginning of the year. In fact, it was the main reason for upgrading my shack computer because the old one could not decode the received signals quickly enough to give me time to reply to calls. But having got the new PC I found the mode rather uninvolving as contacts are made just by clicking buttons to send computer-determined reports and you can't even tell which of the signals you can hear is the one you are replying to. I decided to run the K3 at 5W into the dipole because the K2 was doing 30m APRS gateway duty on the magnetic loop and the two antennas are only a few feet apart. But there was no interference. I'm not sure how much power people normally use on this mode but I might try more next time. My new shack computer coped easily, decoding the received JT65A signals in a second or so despite the fact that it was simultaneously running two APRS gateways one of which was using TrueTTY and a USB sound card to decode the packet data. I found a free spot on the waterfall, sent a CQ and two people immediately came back to me at the same time. I didn't decode anything! I called again and this time three people replied! I sent CQ once more and this time the first two must have decided I was either deaf or an idiot which left just one signal on my frequency: OE1LIC, for my first contact of the day. My second CQ raised RZ6AUJ, Alex for another contact and that was all I had time for before dinner. One of the features of JT65-HF is that it automatically links in to the PSK Reporter network so you can see all the stations you heard on a map and, even more interestingly, all those that heard you. I remembered this and popped up to the shack after dinner to grab a screen shot. As you can see, my 5W to an attic dipole was heard by two stations on the west coast of the USA, and I was only on the air for about 20 minutes! The small blob on the west coast is VE7IRA who was heard by me despite the appalling S9 interference I get on this band, which was reduced to about an S3 by the MFJ-1026 noise canceller using a PA0RDT mini-whip for a noise antenna. I still find using JT65A on HF feels a bit odd but I can understand why it has become so popular, even addictive. It takes up little band space and doesn't interfere with other band users unlike a certain R** digital mode. I said this before and didn't end up doing it but I think I will spend a bit more time using JT65-HF to see what I can work and whether I can join the crowd of enthusiasts for this unusual digital mode. 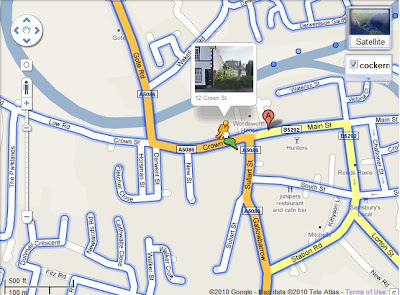 If you've used Google Maps then you have probably tried the Street View feature that lets you look around a place on the map as if you were actually there. Unless you are in Germany, that is. Germany remains the largest European country that is not covered by the Street View service. The German government has forced Google to offer an opt out service that allows people to request that their houses are blurred out of the pictures in the same way faces and vehicle registration plates are. Some privacy campaigners in Germany would prefer that appearing in Street View should be an opt-in feature. I don't know what people think they are achieving by insisting on being able to opt out of Street View. It shows nothing that you can't see just by being there. What are they trying to hide? Anyone can take pictures of an area, upload them to the internet (without blurring anyone's face or vehicle registration number) and link them in a way that anyone searching for pictures of that place will find them. All Google has done is go about it in a more methodical way. Are we going to have controls on publishing photos on the internet now? One of the reasons I'm not endlessly filling my log with DX contacts is because I actually get more enjoyment and interest out of trying new things or just tinkering about. On Sunday I decided to try using my K2 - which has been redundant since the few mobile excursions I made earlier in the year when Olga was away - for HF 30m APRS. I connected it up to the magnetic loop. I didn't have a spare sound card I could use for the packet modem, but the microphone input of the USB dongle I use for computer audio playback was free, so I set it up for receive only. When I previously tried to use that USB audio device to decode HF packet via the AGW Packet Engine I had no luck at all. At the time, I concluded that this was due to 300baud packet being a higher speed mode than PSK31 and the USB device was somehow losing the information necessary to decode it. However it now appears that the reason it didn't work before is because the AGW Packet Engine opens the device at a higher sample rate than most digital mode programs. For the last few weeks I have been using TrueTTY as a packet decoder and this uses a 11025Hz sample rate. I used TrueTTY to decode the audio coming from the cheap dongle and it appears to be just as sensitive as it was when the audio was coming from my best sound card. This morning I tried listening on 14076kHz, the JT65A frequency, and decoded several stations despite the high noise level on 20m. So it seems to me that it is possible to use these cheap USB dongles for sound card digimodes as long as the software you use samples at 11025Hz. Some programs unfortunately don't let you set the sample rate and may use a rate as high as 48000Hz. This is unlikely to work if my experience is anything to go by, so I still don't recommend that you buy one of these cheap devices for digimode use unless you have a specific application in mind that you know it will work with. I have now ordered another of these cheap USB dongles which I plan to make into a "DIY SignaLink USB" with the aid of the digital VOX circuit developed by Skip Teller, KH6TY. This will allow me to use the K2 for HF APRS, WSPR or other QRP activities using the magnetic loop, and free up the K3 for other purposes using the multiband dipole. In fact I will then be able to use four amateur bands and four different radios simultaneously if I want to! Over the last few days Lynn, KJ4ERJ has been adding some very cool features to APRSISCE/32 which I've been helping to test. The ISS packet digipeater is still operating so as there were several good passes during the daytime I've been playing on it as well. Today I managed to hear my own beacon repeated back by the space station, and this time it was also gated to the internet by TF8TTY so my call showed up on the map of stations heard through the ISS at ariss.net. I also managed to send a couple of messages through the bird. Tim, G4VXE was impressed to receive a greeting relayed via the space station. I also managed a two-way exchange with Marc, PD4U, which I think counts as an actual satellite contact. Of course, whilst it's fun to bounce radio waves off a satellite it isn't a very practical method of communication. The ISS is the best QTH ever and it can hear all the activity on a frequency at the same time, so communication is only possible if not too many people use it. Lots of messages never get anywhere because they are sent at the same time as messages from other people which you can't avoid transmitting over because you can't hear them. The space station decodes only the strongest, so turning the power up improves your chances of success quite a bit. You can get through the ISS using a hand-held VX-8, but only at 4 o'clock in the morning when most sane people are asleep, unless you are incredibly lucky. The new feature in APRSISCE that I mentioned is the ability to open separate windows so you can track individual stations at a more detailed mapping level. Lynn has called this Multi-Track(TM) and he thinks it will be very popular with emergency communications teams who will be able to see the entire area of the event in the main window and see exactly where individual team members are at the same time. It's only available in the development (beta test) versions at the moment, though. The great thing about the internet is that you can find the answer to anything. You may not understand the answer, it may not even be the correct answer, but you can find it. And sometimes you will find out more than you were expecting. Yesterday I happened to think "If I have a computer or smartphone with a GPS, can my position be accessed from its web browser?" A quick search of Google turned up the answer that yes, it could, in newer browsers that support HTML 5 like Firefox 3.6 and Google Chrome and the Android web browser. I even found some example code showing how to use it. I made a test page to try it out for myself. The results were a little unexpected. First I tried it using my shack PC, which is a mini-tower with only a wired connection to my router. It told me that I was in Sheffield. This was actually not unexpected, as that is similar to the location I see when visiting some blogs that have a widget to show where visitors come from. I presume they, and the web browser, use geolocation by IP address if that is the only available method, and Sheffield is presumably the location of my broadband ISP's data centre. When I tried using my smartphone running Android I saw the GPS status icon flicker on for a couple of seconds and my page then reported my position as being in Broughton, a village a couple of miles west of here. I'm guessing that the GPS didn't have time to get a good fix so I got a poor one, or else it is reporting the location of the cell the phone is connected to. But the really surprising result was when I tried using my laptop. This doesn't have a GPS and is connected using wi-fi to my router, so it has the same IP address on the web as the shack system. Yet my test page pinpointed my location as across the street over the back, only about 20 yards from my actual location. I tried my netbook as well and got more or less the same position . How the heck did it know where I am? After a bit more Googling I discovered that this is done by triangulating your position using the names or SSIDs of the wi-fi access points your computer can receive. A firm called Skyhook has created a database of access points and their locations by driving around every street in every town and city in the US. There is also a site called Geomena.org that has an access point database created by ordinary individuals. 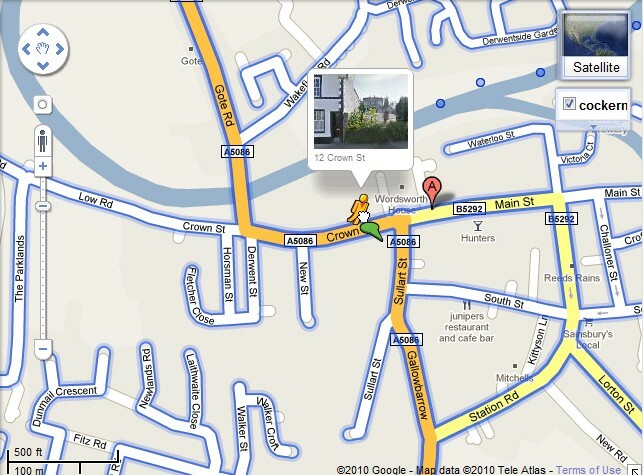 You can even add to it by installing a client app in your iPhone or Android phone and going walkabout. Google has a database which it presumably created at the same time it drove around doing Street View mapping and snooping on people's unsecured data. In Firefox you can see which wi-fi geolocation database is used by going to the address about:config (no http://) and examining the value of geo.wifi.uri. By default it's Google's. You can also disable browser geolocation by changing the value of geo.enabled. I think the geolocation feature is pretty cool but I'm sure many privacy-obsessed types will be horrified by the thought that even without an actual GPS their position can be located to that kind of accuracy. If you do try my test page I'd be interested to know, via comments, how accurate the position was and whether your computer had a GPS, wi-fi or you were using a smartphone. If you have a mobile wi-fi device, does it track your position as you move around? If the results are promising I might make a permanent page for determining your grid locator using geolocation. The Micro SD card I ordered arrived on Monday so I was eventually able to try installing the Google Android OS on my HTC Touch Pro. The delay turned out to be a benefit as I was able to take the advice of Eric SA5BKE who commented to my earlier post that he had found a better set of installation instructions to the ones I mentioned. Still, as usual when I try to do anything with computers, if something can go wrong it will. First, the phone could not see the new SD Card. I had to format it with a utility from the SD Card Association. Then I messed up the screen calibration where you have to click, when prompted, on the corners of the screen, and wasted some time trying to recover from my mess-up. 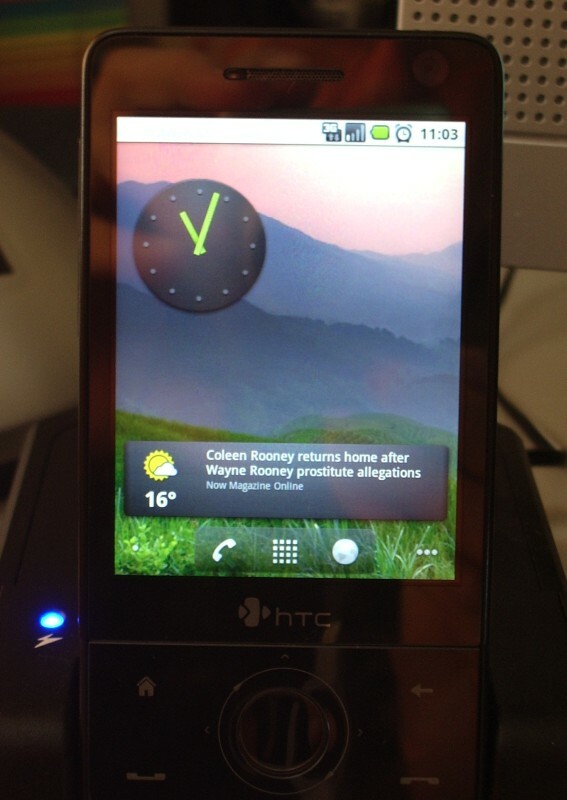 But eventually I was rewarded with the sight of the Android home screen on my HTC Touch Pro. The effort was worthwhile. I really like the Android OS. It is so much better a smartphone operating system than Windows Mobile 6.1. You still feel that you are using a phone, not a Windows PC that has an annoyingly small screen. Making phone calls and sending text messages is really simple, as it should be. And once you have found out how the new OS is supposed to be used (since the download doesn't come with a user guide) it's easy to use. I am a huge fan of Google - I have five GMail accounts and probably make hundreds of Google searches a week - and what I really like about Android is the way Google features are integrated into the OS. Until now I could never understand why people liked smartphones and would actually want to use them to answer email because my experience was based on trying to access GMail using one of the two awful web browsers on my Windows phone. But now I get a notification whenever a new email comes into any of my inboxes and I can either clear it or click on the email to read it in full or reply on a display designed to make full use of the small screen. I guess that's how other smartphones work if you have a corporate mail server running Microsoft Exchange, but I've never had one. I was also very impressed with the Google search widget on one of the virtual desktops of the home screen. It had a microphone icon so, out of curiosity, I clicked it and was invited to speak. A moment later it typed what I had said into the search box and was performing a search on it. Fortunately I hadn't said something rude! I then had some fun composing emails and text messages without using the keyboard. Unfortunately the speech engine doesn't recognize words like "comma", "full stop" or "newline" as punctuation and formatting, nor does it recognize commands like "send." But I was very impressed with the accuracy with which it understood what I said - the last time I tried voice input was at least a decade ago on a PC and I found it ultimately frustrating. One of the applications I was keen to try out was Navigation, Google's free satnav program based on Google Maps which is not available for Windows Mobile. I haven't had a chance to test it in the car, but it seems like the full works, with a text to speech engine that barks directions at you. The optional but probably rather unnecessary satellite view looks rather cool, though I was rather less impressed by the route it suggested from home to Keswick, south-east of here, which involved turning right at the end of the cul-de-sac and going north, then west for a mile to reach the A66 before going east, instead of turning left and heading east which would save best part of two miles. My old satnav does that too, but that's because the estate hadn't been completed when the maps were made and it believes the top of the estate is still a building site. 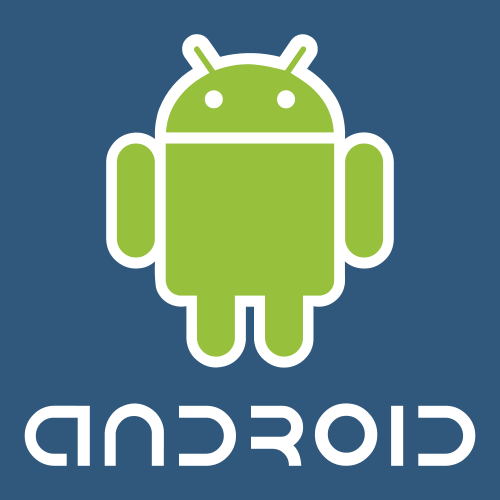 The Android Market contains thousands of apps that you can download, either free or for a modest charge. However, sorting the wheat from the chaff seems like one of those things life's too short for. It reminds me a bit of the early Windows "shareware" market when anyone who had taught themselves Visual Basic thought they would be the next Bill Gates by releasing some flaky software that did very little and usually crashed as soon as it experienced some condition the programmer hadn't thought of. There seem to be very few ham radio applications, though, and almost no really good ones. I saw quite a few apps to do with Morse, giving the lie to the idea that code is dead, but nothing that looked worth trying. The only professional quality radio application I could find is the new EchoLink client for Android. My feelings about this have mellowed a bit since I wrote about it just over a week ago. Last Friday just before dinner I received a call through my EchoLink node from Practical Wireless VHF columnist and fellow blogger Tim Kirby, G4VXE, who was on his way home from work by train and called me using the EchoLink client for his iPhone. Though we've exchanged blog comments a few times it was very pleasant to speak with Tim for the first time. This was a contact we would be unlikely to make over radio and certainly not in that particular situation. Only EchoLink made it possible. In the interests of research I had a conversation with myself using the EchoTest server and found the audio quality to be just as good as when I use my Kenwood TH-F7E to make contacts via my RF node. However the cellphone client has one disappointing limitation. You can't make a direct connection using the cellular network. You have to use a communication option called "Relay" which only allows you to call other non-cellphone EchoLink users. It doesn't allow other EchoLink users to call you. It's a bit like having a radio and not being able to call CQ. I was somewhat unimpressed by the Android APRS app, APRSdroid, not just in comparison with Lynn, KJ4ERJ's APRSISCE for Windows Mobile, but even with the iBCNU app for the iPhone. The user interface is basically a console window: you can see position packets going out, and if you wish you can see raw packets of other users within a selected radius of your location. There is no support for messaging at all in the present version. Tracking doesn't seem to work very well either, unless you are also running another application such as Navigation that keeps the GPS on all the time. I think the problem is that the app tries to save power by turning on the GPS, waiting for a fix and then turning it off again until the next time interval. It didn't work too badly when the phone was sitting in its charger cradle on my desktop, but getting a GPS fix when you are moving can take a very long time. There is a need for a simple APRS tracking and messaging application for Android but this has a way to go before it gets there. 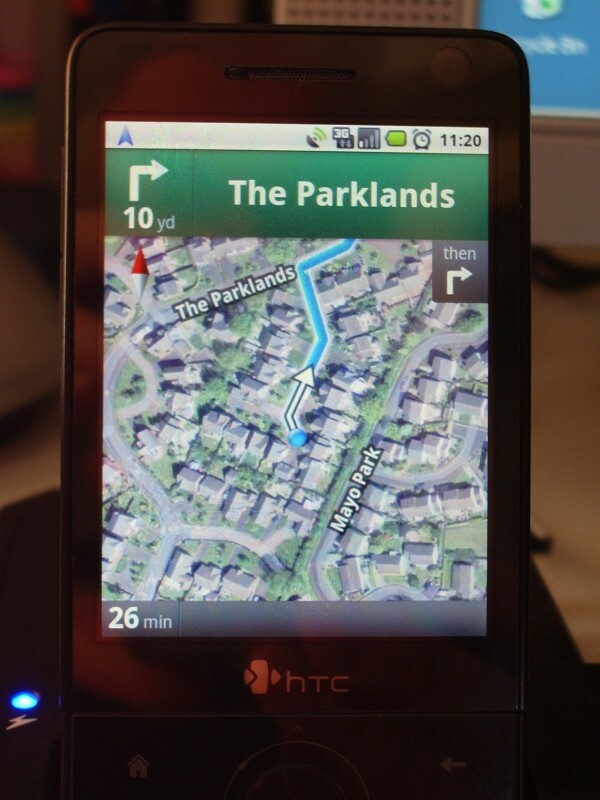 The HTC port of Android OS is not an official release and has quite a few bugs and things that are still To Be Done. I've had the phone lock up and fail to respond to anything and have had to pull the battery a few times. There is no support for the built-in camera and the battery charge indication is completely fictitious. It's also best not to use wi-fi as it warms up the phone and consumes a lot more power than under Windows Mobile. Unlike most people I bought my HTC Touch Pro SIM-free and unlocked because I don't like to be tied to a network. As a consequence I'm not going to be offered an upgrade for no extra cost when my contract runs out. I need to keep the phone for a while but I'd be more than happy to dump Windows Mobile because as a phone it's too much hassle, even though it does allow me to run some pretty powerful applications. I hope that the issues with the HTC Android port will be resolved in order that it becomes stable enough and functional enough for me to use it on my phone all the time. As so many people commented on my post about my apparently failing hard drive I thought I'd post an update. Dell had me run some diagnostics that are on a special diagnostic partition. I ran the entire set of hard disk diagnostics which took most of the day including a full surface scan and the drive passed all tests without a single error. Therefore as far as Dell is concerned there is nothing wrong with the hard drive. It's possible that as Steve GW7AAV commented the operating system has marked the bad sectors so they won't be used any more, in which case hopefully the issue was just a one-off. In order to keep an eye on the situation I decided to look around for a SMART hard drive monitoring utility which can display the statistics stored on the hard drive controller, preferably a free one. My searches located one called Active@ Hard Disk Monitor Free which seemed to display an impressive amount of information. This program said the Health Status of my hard drive was OK, though the value was only 55% which didn't seem too healthy to me. It's up to 57% now, which makes me think that something bad did happen and the value will slowly improve with continued error-free operation. A look at other screenshots of the program showed values in the high 60s so perhaps I shouldn't expect to see close to 100%. Hopefully if the problem occurs again this program will provide more information about what actually happened. Annoyingly, when I started the computer the next day and looked at the stats I saw that Active@ Hard Disk Monitor Free is not free at all. It is a 14-day trial version. When I checked download.com I saw there were a lot of complaints about this. The old version was free, but not the current version. However it is only $6.99 to purchase a license for one PC so rather than waste more time trying to find another free alternative I have decided to pay for it. Two months ago I got a new Dell Inspiron laptop to use for my work. I have been very pleased with the computer which is quite fast and has a good keyboard and a very nice screen. However this afternoon I switched it on to do a bit of work and was typing away when the hard drive started making a noise like a cat with indigestion - which anyone who has ever done tech support will recognize as the sound of a hard drive attempting to read a bad sector. This morning I worked Kei, JI1BBN, on 15m PSK31 using 50W to the MFJ magnetic loop in the attic. I heard several other DX stations on both the loop and the dipole, including DU3MEL in the Philippines whom I last worked in 2003, also on 15m. That was also the last time I worked Japan. 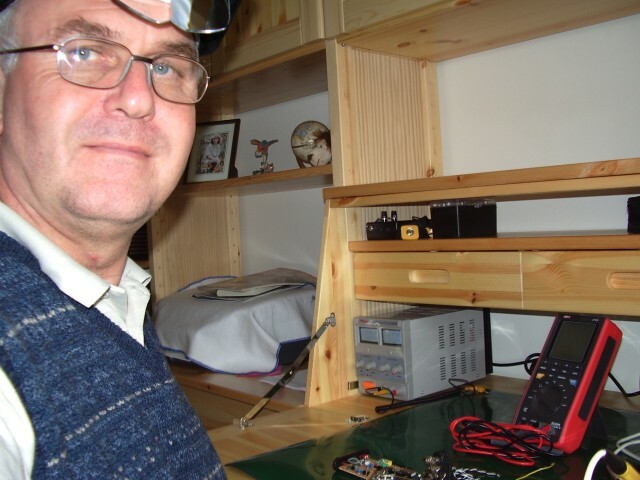 Then I would only have been using QRP with my Elecraft K3, and the antenna would have been a horizontal loop of wire round the perimeter of the attic, with a 4:1 balun at the centre of one side, tuned using the K2 internal ATU. What's that about stealth antennas not working? The International Space Station has had its packet BBS / digipeater active for the last few days on 145.825MHz. Noel G4PEW asked me in a short APRS chat last night if I had tried listening to it. It had been a long time since I tried bouncing anything off the ISS as I got fed up with checking if the station was operational and finding that it wasn't, so I decided to give it a go to break the monotony of nothing much happening terrestrially. I was using APRSIS32 to send the beacons and messages and I guess that it didn't gate my digipeated packets as having been received via the ISS because it had already sent them to the internet direct at the time I sent them. I'm surprised that none of the other stations sending signals up to the space station were gating them during the receive periods. We aren't talking about important communications here, just seeing if it can be done, but it would be nice to have the proof of it afterwards. Come on, chaps, play the game and get your gateways working! 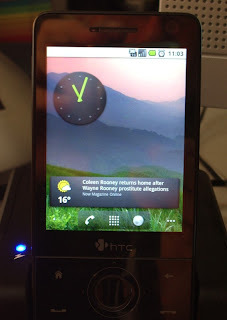 A few days ago I came across a forum thread discussing ham radio applications for smartphones in which someone claimed that they were using an HTC Touch Pro (the phone I have) dual booting into Windows Mobile and Google Android. I was interested, but imagined that achieving it would require the ability to follow exactly a lengthy sequence of obscure commands with a high probability of turning the phone into a brick. However I was unable to resist looking into it further and discovered that it should be easier than that. 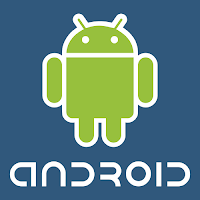 It should be simply a matter of extracting an image of the HTC Android port on to an SD card, copying a configuration file that matches your model of phone into the root folder and then running a program (under Windows Mobile) that reboots the phone into Android. Unfortunately I don't have an SD card of the type used by the Touch Pro so I haven't been able to try it yet. I originally bought a smartphone running Windows Mobile specifically because it would run Lynn KJ4ERJ's APRSISCE, which is undoubtedly the best APRS client on any smartphone by several hundred miles. However, for me that is really about the only good reason for using that platform. I don't need the ability to sync with Outlook or use Pocket Office as I don't use any Microsoft applications on my PCs, and I find Windows Mobile to be too much like Windows itself - complicated to use - and not enough like a phone - easy to make phone calls and text messages. Plus, the fact that running APRSISCE all the time drains the battery in a couple of hours leaving you without a working phone has been a big disincentive to using it in the way I originally envisaged. Whilst Windows Mobile 6.x is an undoubtedly powerful platform, as you can tell from the range of full-featured applications (not just "apps") available for it, it is also a dead end. I was surprised to find that Windows Mobile currently has just 5% of the market. Microsoft is hoping to reclaim some of its market share with the upcoming Windows Mobile 7. Personally I think it's too late and Microsoft has missed the boat on this one. I think Microsoft has an over-inflated opinion of the Windows "brand". People use Windows on PCs because they don't have much of an alternative, not because they think it's great. Smartphone users have lots of choices. People love Google because they are always giving us stuff for free, while Microsoft always makes you pay (and then keeps checking your receipt afterwards). So I think Windows Mobile 7 is doomed even if Microsoft hadn't decided to make it incompatible with earlier versions so that it won't run any legacy applications - including APRSISCE. I really wished in the end I had bought an Android phone. Now this dual boot trick will allow me to try the Google OS out and see whether it is really is as good as the hype. More when I receive the SD card I ordered and am able to try it. It's always good to hear when something one does or writes inspires somebody else to try it and they are pleased with the outcome. Sivan, 4X6IZ, made a version of my portable Wonder Loop and found that "it works as advertised." He has put some information and pictures of it and another loop he made on a website. His idea of using polyethylene coated aluminium pipe to make a fixed frequency loop and tuning capacitor is particularly interesting if you always operate close to a particular frequency such as for QRP CW, PSK31 etc. If I had space in my attic for another magnetic loop I could dedicate for HF APRS use I would definitely make one of these. I'm sure you'll find it worth reading about Sivan's magnetic loop antennas. If you're operating the PSK digimode on the weekend of 18th-19th September and suddenly find your screen full of PSK63 signals that you can't decode, don't be worried that there is something wrong with your radio or your computer. You are hearing the 7th CIS DX QPSK63 Contest 2010. Yes, it's QPSK63, that mode you've seen on your menu and never been able to get a reply to when you tried it. If you were ever frustrated by this, now's your chance to get satisfaction! Starting at 1200UTC on the Saturday and continuing until 1200UTC the following day, the object is to make as many contacts as possible using QPSK63 (and only QPSK63) between stations in the Commonwealth of Independent States (known to many of us as the Former Soviet Union) and stations who are somewhere else. For more information see the contest website. If you prefer SSB to digimodes, look for the upcoming 1st DX Esperanto Contest. It's a contest for phone operators, where all the contacts must be made using Esperanto. I was reflecting on what I wrote yesterday about the EchoLink app for Android and why I find it and similar developments disturbing. I thought it was because it made me uneasy having to face the fact that the internet and a cellphone appears to make ham radio redundant by allowing us to make the same contacts so much more easily without using the ham bands at all. Then I had a blinding revelation. Ham radio is not about making contacts. It is about not making contacts, or making them only with luck and some difficulty. I almost stumbled across this truth a few months ago after I sold my first VX-8R to do APRS on a smartphone using Lynn KJ4ERJ's excellent APRSISCE software. It worked far better than the 2m radio, allowing me to be tracked and exchange messages in places where there was no 2m signal. But I went back to using RF for precisely that reason. The smartphone didn't provide the interest of allowing me to see how VHF RF propagates around the local terrain. The disappointment of not being tracked as I slogged up the mountain was balanced by my surprise when a beacon was gated from a location I wouldn't have thought possible and the interest created in working out how it happened. There is also the technical challenge of finding ways to improve coverage and get a radio signal out of difficult locations, for which buying a smartphone is simply a cop-out. When you look at other ham activities that remain popular or are even gaining in popularity it's obvious that the interest is not in how easy it is to make contacts, but how hard. DXing isn't about pressing the PTT and ticking another entity off the list a minute later, it's about what you have to do - buy equipment, improve your antennas, learn about propagation, develop operating skills, be patient - in order to achieve it. People boast about the DX they've worked, but what keeps them interested in DXing is the places they haven't worked and how hard it will be to work them. Dialling up a contact using an internet application has nothing to do with it. Contesting isn't popular because it's easy to amass a winning score but because you need the best equipment, the best antennas and lots of skill to get even close. It isn't meant to be a level playing field. That's why many people dislike developments like reverse beacons and skimmers that take away some of the skill required. The thing about VHF FM activity is that for the most part it isn't about the achievement of the contact at all. It's just about being able to converse with people. When I was first licensed, before mobile phones and inclusive call packages, chatting on 2m FM was actually the best and certainly the cheapest way of keeping in contact with my local ham friends. But things have changed over the last 35 years and I haven't been paying attention. I'm the dinosaur who wouldn't disclose his mobile number to the radio club database because I felt that if someone wanted to talk to me about radio they could wait until they can contact me on the radio. But I suspect that everyone else has moved on. If they want to speak with one of their ham buddies they pick up the phone. Which may partly explain why the VHF bands these days are almost dead. Or even the development of D-Star, which provides some of the convenience of calling someone on the phone without totally abandoning use of the ham bands. 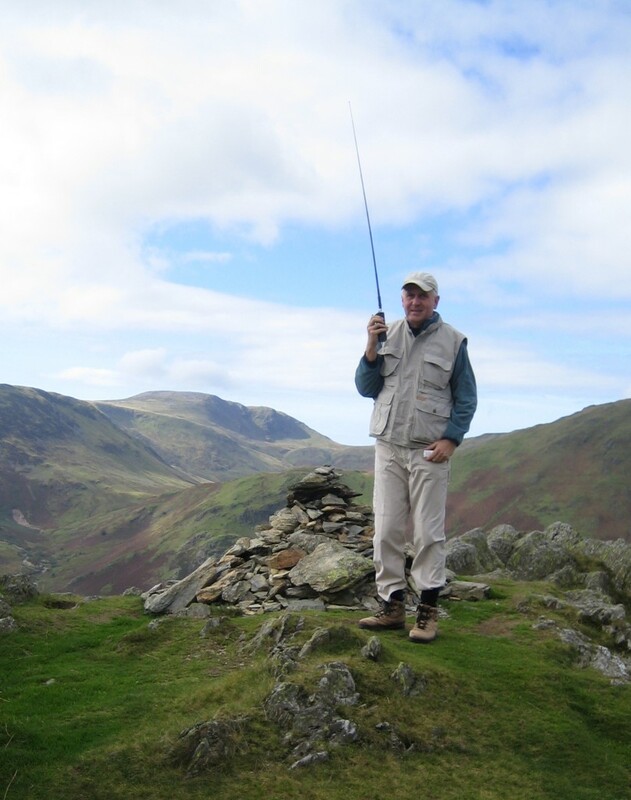 In only a handful of pursuits like SOTA and WOTA where the point is to make a contact direct using radio is 2m FM still used in what I would call a traditional manner. People will struggle to hear their signal report even if the activator is right down in the noise and get a feeling of having accomplished something when they are successful. So EchoLink on a smartphone really doesn't change anything. It already changed. Whether hams call one another on the phone using their phone number or their EchoLink node number really makes no difference. It has just been blinkered thinking on my part to have felt that if people hold ham radio licenses they ought to talk to each other using ham radio even if it isn't the most convenient way of doing so. An EchoLink app has recently been released for Android mobile phones. That makes two smartphone platforms - Android and iPhone - that can now be used to access EchoLink. Is this really a good idea? Let me make it clear from the start: I like EchoLink. What I like about it is that it can be used to link repeaters in different parts of the country or the world, and even allows individual operators like myself to set up simplex voice nodes without the technical complications, expense and licensing issues of running a repeater, the aim being simply to get some interesting activity on what may otherwise be a more or less dead band. I realize that contacts made using EchoLink are not traditional amateur radio point to point contacts, so I don't want to start up the old "it's not ham radio" argument again. But I don't think the point of most contacts made on VHF FM is that you worked direct and exchange QSLs afterwards. They are just conversations between hams. The fact that the transmission went most of the way over the internet is of no more significance than if you used a conventional repeater. However it does matter to me that radios are used at each end, otherwise it's internet chat not a radio contact in any shape or form. So far, that seems to be the case with most of the EchoLink contacts I have made, but for how long? The trouble with EchoLink apps for smartphones is that they are VoIP apps pure and simple. They encourage the use of EchoLink as a VoIP chat mode. Smartphones are so popular now that I'm afraid this could become the dominant way of using the system. It could even replace ham radio handhelds. Users are going to ask themselves: Why bother carrying this goofy looking radio about when I can just use my phone? One more nail in the coffin of amateur radio? Observant readers may have noticed a change in the "strapline" in the header logo of my blog. It now reads "My position on amateur radio." The new strapline reflects more accurately what the blog is currently about. If you haven't already realized, it is also a play on words. "My position" alludes to my present interest in APRS which is the subject of many of my postings. But it also makes it clear that this is an opinion blog; that I use this blog to express my thoughts on various ham radio related matters, to give my point of view without any obligation on my part for that view to be fair, balanced or uncontroversial. So don't expect any changes to the content, other than a gradual evolution as my interests move from one thing to another. I expect that I will still occasionally write on topics related to stealth ham radio operation, but I feel I have probably pushed things about as far as they can go in my present situation. Now it's just a matter of waiting and hoping that I don't experience the Final QRN that puts paid to my radio activities for good. David Rowe has released an early version of his low bit rate open source digital voice codec. Whilst this is certainly a significant achievement, I can't get very excited about it for two reasons. First, it is incompatible with the AMBE codec used by Icom in D-Star, so it is never going to be able to work with existing D-Star equipment and it is not all that likely that it will be incorporated in future versions. And second, I still don't see what benefits digital voice offers us as radio hams in the real world. Digital audio gives you clear "fully quieting" audio up until the signal starts to be lost, when it quickly breaks up and you get nothing. Analogue audio experiences a gradual degradation as the signal gets weaker. Those who have used the two report that an analogue signal is usably copyable about 15 - 20% further out than a digital signal. I can understand that for some professional services nothing but clear copy will do. But we are amateurs who are supposed to be good at digging weak signals out of the noise. Is this really "progress", in the context of what ham radio is used for? The other reason for my antipathy to digital voice is that I question whether we need another voice mode at a time when VHF analogue voice operation itself seems to be in decline. Surely it would be better to be making more use of existing technologies like Echolink to create more activity for users of existing equipment than to introduce new digital modes that will have an even smaller number of users. I've seen D-Star radios up for sale because the original purchaser found there was hardly anyone to talk to, and D-Star has now been around for several years. I don't see the availability of an open source digital voice codec changing that situation somehow. The popularity of web videos and podcasts means that most ham radio enthusiasts who want to use sound card digital modes no longer want to dedicate their computer's built-in sound card for that purpose. The usual solution is to buy a purpose made interface such as a RigExpert or SignaLink (expensive but highly recommended by all who own one) or an external USB sound card. However a great many people claim that the cheapest USB sound card "dongle" costing just 99p on eBay is good enough. Take it from me, it isn't. I have had several online discussions bordering on arguments with self proclaimed experts who claim that the sound chip in these cheapo "dongles" is exactly the same as the one in a £100 SignaLink USB interface so the £1 dongle must be just as good. I have no idea if they are right about the chip. What I do know is that when I played back a recording of very weak CW using one of these devices all I could hear was noise. And when I tried to use one of these devices to decode a fast digital mode such as packet, I decoded nothing at all, not a single packet, even though I could see the signal loud and clear on the waterfall. I have tried a number of these cheap devices. I bought two of the cheap thumb sized "dongles". One I threw away after seeing the noise it introduced on the waterfall. The second I bought thinking it would be good enough for computer audio, which it was, but had to throw it away when it failed after a week. I also spent a bit more on a slightly fancier sound card "dongle" which I currently use for computer audio, but which still displayed the inadequacies on weak signals and fast data modes that I have mentioned. Finally I tried the device pictured above. It doesn't have a brand name but can be readily identified from the picture and is advertised on eBay as something like "USB 6 Channel 5.1 External Sound Audio Card For Laptop". It costs around £8.50 including postage from China. 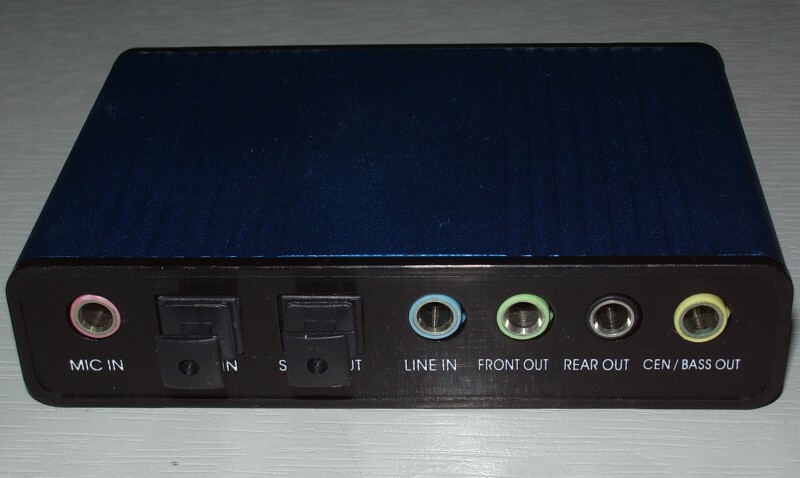 It comes in a small extruded aluminium case, has connections for SP/DIF input and supports sample rates of up to 48kHz so it would probably be suitable for basic SDR use. It has decoded every digital mode I have so far tried it with. And it's small enough to build into your own box to make a DIY SignaLink. It comes with a mini-CD containing a Windows driver. This installs a small mixer/control panel application that loads in the task bar and provides the usual control over the various sound effects. I used one of the start-up program managers (Autoruns) to remove it and find that it works perfectly well for my purposes without it, just using the standard Windows mixer settings. This is certainly preferable to the Creative SoundBlaster USB device that some people recommend which allegedly installs 200MB of junk on your hard drive. I think this is probably the cheapest external sound device that is worth using for sound card digital modes. I'd be interested to know of alternatives, but please don't recommend something unless you have actually done A/B comparisons with a known good sound card using weak signals, fast modes and different software packages. I hate to think of the frustration some people must have experienced following the advice of the self proclaimed experts, buying one of the £1 "dongles" and wondering why they can see a trace on the waterfall and can't decode it. 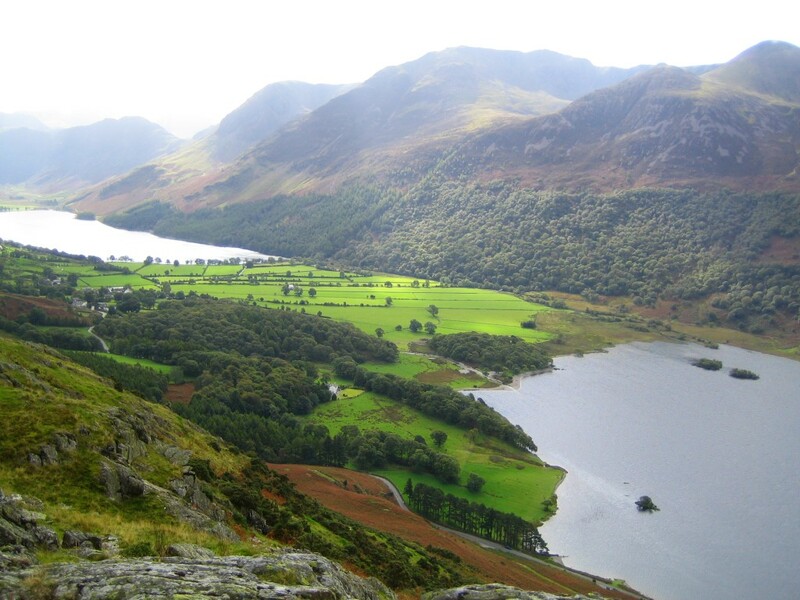 I think it's fair to say the Wainwrights On The Air (WOTA) scheme has become a big success. 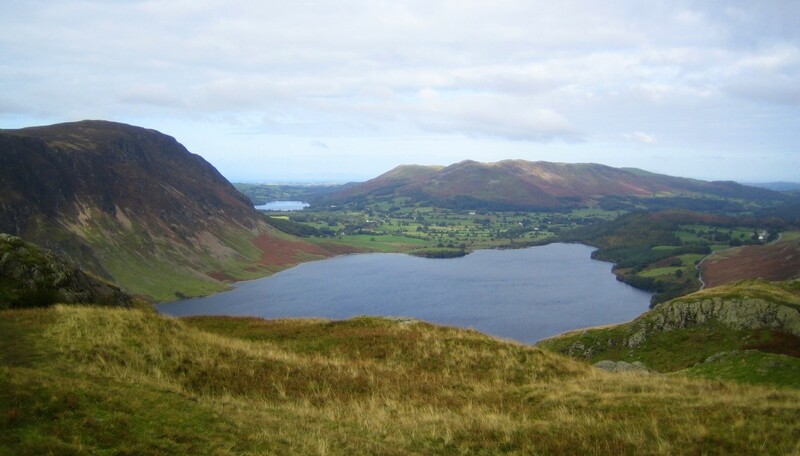 At the start it was probably true that the main participants were existing Summits On The Air (SOTA) enthusiasts who appreciated the opportunity to make more of their Lake District excursions by activating the hills they would otherwise have walked past on their way to a SOTA summit. But recently several local amateurs have got started specifically in WOTA chasing and activating. There has even been a request for a list of the easiest Wainwrights to climb! 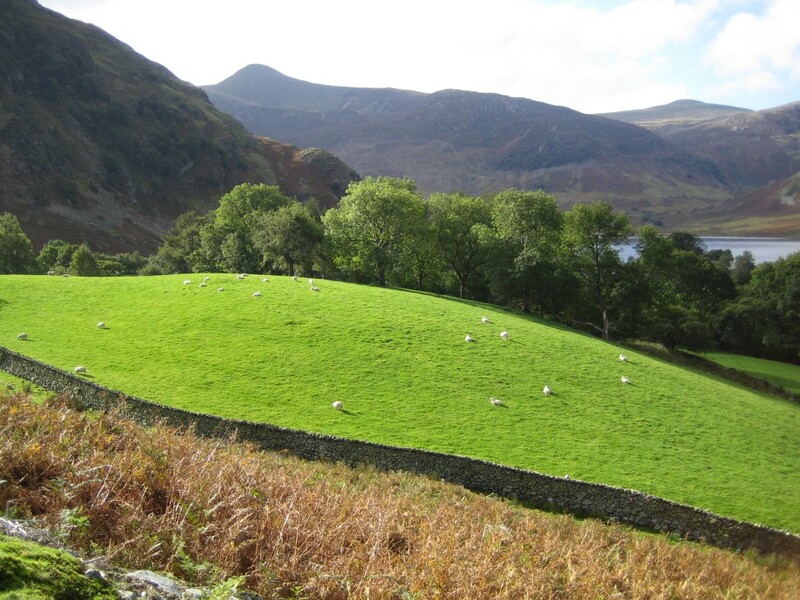 There isn't an award for that, but it does suggest that WOTA is encouraging people to get out on the hills who were not previously enthusiastic fellwalkers and I think that is one of the best possible outcomes for the scheme. It's a pity, though, that no-one offered to design a nice award certificate for the scheme, which the Workington Radio Club was then going to get professionally printed. The ones I made using a free online certificate maker and print on our cheapo HP multifunction printer (with expensivo ink cartridges) look a poor reward for all the time and sweat that has been expended earning them. I always have a fight getting them to print correctly anyway, so having some professionally printed certificates would have saved me a lot of hassle. It has been a while since I wrote about the new APRS client for Windows and Windows Mobile being developed by Lynn, KJ4ERJ and known as APRSISCE/32 but it has been coming on apace with new versions being released almost every day. Many of the improvements probably won't mean much to anyone who doesn't know anything about APRS. But one of the more recent and quite revolutionary developments has been the chat window, which allows you to carry out a two-way text chat conversation with another APRS user. Instead of the primitive edit box found in most APRS clients in which you would have to type your messages in 64-character chunks due to the limitations of APRS messaging you can now type just what you want and APRSISCE/32 will split it up and send it as separate messages transparently. It also takes care of ensuring the parts are displayed in the right order at the other end. You can also view the entire conversation in its own window - useful if you are having conversations with two or more people when you are tired late at night and lose track of what you are saying to whom! You can chat with anyone, anywhere in the world. True, at the moment most of these conversations are being conveyed over the internet not RF, which will inevitably incur the complaints that "it's not ham radio." But they could just as easily use RF. The only problem is that for most of us an adequate APRS RF infrastructure to support worldwide messaging doesn't exist. But the more people are attracted to the mode - and even the hobby - by cool developments like this, the more likely it is that an effective infrastructure will be built. In many parts of the world you could certainly link up across town on VHF like this. Regular digital modes are fun. But is there any reason why the only way to have a contact is for two people to have sole occupancy of a frequency and one sends to the other, then the other replies back, repeat until finished, the way contacts have been made ever since Marconi first picked up a morse key? I was in the shack making a few adjustments to the Echolink software configuration. The K3 was on 30m APRS with the speaker volume turned down to almost inaudible. Suddenly, at about 1410 UTC, I heard a buzzing type of interference. I looked at the TrueTTY waterfall and saw there were interference bars every 50Hz right across the screen, strong enough to prevent anything from being decoded. 50Hz is the mains frequency here in the UK. With a sinking feeling my immediate thought was that one of the neighbours had discovered a new way to make the HF bands unusable. Then I remembered that Lynn, KJ4ERJ had posted a screenshot of similar interference only the day before in an APRS forum. I checked back, and sure enough the interference Lynn had seen in Florida was exactly the same. I don't know what it is, but I don't think even my neighbours are capable of generating interference that could be heard across the Atlantic. It's still going strong 30 minutes later. I haven't seen an HF band wiped out like this since the Woodpecker fell silent back in the '80s. Well, at least I've got Echolink! A couple of months ago I acquired a Kenwood TM-D710 dual band FM transceiver with APRS as it was the best solution to the problem of how to operate an APRS gateway without losing the ability to monitor for voice contacts on 2m when you do not have the space for two widely separated antennas. I have been quite pleased with the radio but rather alarmed at the number of reports of loss of sensitivity due to the failure of one or more of the IF filters. I asked on the Kenwood Yahoo group whether this was just a faulty batch of filters affecting radios of a certain age or a generic problem that was likely to affect any TM-D710 eventually and was directed to this explanation in the blog of Tasos, SV8YM. It has been a long time since I read such a well written explanation of a technical phenomenon and I'm sure you'll find it interesting, especially if you own a VHF radio with 455kHz IF filters. In fact I'm sure many of you will find other articles of interest in this blog. I've added it to my regular reading list. Olga and I have returned from a long weekend in London. I took my VX-8GR along, hoping to see some APRS activity or even make some contacts. But I heard absolutely nothing, nada, zilch, not a braap on the APRS frequency nor any signs of life on the simplex or repeater frequencies. Twenty years ago I lived in London, in Charlton SE7 and I seem to recall that in those days there were four London repeaters on 2m and plenty of activity. I also seem to recall that some of the repeaters were plagued with abuse. Last weeked even a kerchunker or a pirate playing music would have been a welcome sign that someone was using the amateur frequencies. I took a laptop with me - the small Eee PC running Ubuntu Linux, with APRSIS32 under wine - to monitor activity and see if my RF beacons were heard. I received a greeting from G5YC via the APRS-IS internet network and that was that. What a contrast to Prague, where I was a month ago, where the APRS activity just didn't stop. Tim, G4VXE, posted yesterday about creating APRS objects for repeaters using OpenAPRS.net. I commented that it was all very well, but these internet created objects are never transmitted on RF so they never fulfil the intended purpose of the mode which is to inform visiting mobiles of the local repeater frequencies. Unfortunately with the lack of radio activity here in the UK one cannot deny that APRS works much better as an internet application than it does over RF. Anyone who has a computer can call up aprs.fi and see the local picture - if anyone has taken the trouble to create the objects. If they were transmitted on RF, would anyone hear them? I could say much the same about 2m FM. If I'd had an iPhone I could have made some contacts using the newly released Echolink app, which again is more than I was able to do using my Yaesu. What has happened to ham radio that one can't find any activity even in the UK's biggest city? It seems to me that we have all decided that cellphones are a much better tool for contacting our ham buddies. If we lost the use of the VHF and UHF bands would anyone actually notice?